For the last few months we have been hearing about the American election. Hot hot debates were going on about who would be the next President of United States of America. After much anticipated wait, the day had finally come and the results are out and Donald J Trump is elected the 45th President of United States of America. This has been a historic election and many people are shocked by the turn of events as Donald J Trump, a novice in politics and to military, getting elected as the President defeating his opponent Secretary Hillary Clinton who has 30 years of political career. Today,many news channels report of people all over the world being scared about what is to unveil in the coming days and I just want to reassure you all through scripture, that God is in control and nothing will happen to you without His knowledge or permission. If you are a child of God and walking upright, He will not withhold any good things from you and He will be with you and guide you and carry you in your difficult days. 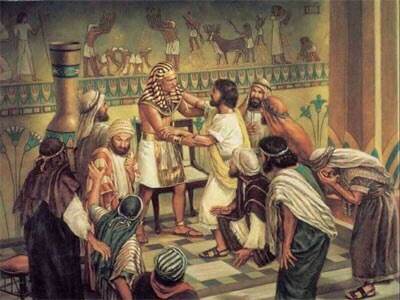 In 3500-3000 BC a man named Joseph, the 11th son of Jacob was sold and sent as a slave to Egypt (a super power during those days). He was a very righteous man as we read in the book of Genesis and after an unbelievable turn of events, he became the Prime Minister of Egypt! Unbelievable situations happened to him, he who was the great grand son of Abraham, who was immensely rich and who his father Jacob loved the most, had been sold by his own brothers and sent to Egypt as slave! Joseph lost his position, his wealth, his time (13 years), his land and even his precious robe that his father gifted him. Joseph lost everything but they couldn’t take away one thing and that was God! For it says Joseph was sold to Egypt but God was with him. Later he was put in prison as a criminal for no reason. There also we read God was with Joseph and since God was with Joseph, he didn’t end his life as a prisoner, but God made the events in his life to turn in such a way, that God delivered Joseph out of prison and made him second to Pharaoh! If you walk upright no good things shall he withhold. Even if you go through hard situations God will deliver you and bring you to glory! 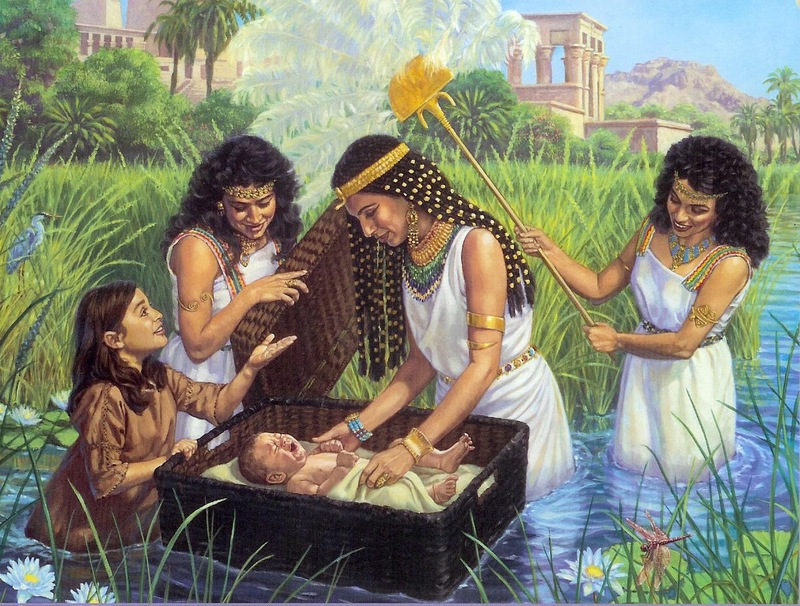 About 500 years later, a baby Moses was born in a very bad time where he was rejected his right to live for Pharaoh had issued a new rule to throw away all the newborn male babies into the river of Nile! His family secretly protected him for 3 months, by then all their lives were in danger and so they had to put him in a little boat made of reeds and set him in the river Nile. God took charge of the situation and made the Pharaoh’s daughter to bathe in Nile and God made her come by the river at the exact same time as Moses’ little boat appeared in water and God made her heart and all those who were with her and surrounded her to be kind enough to raise the baby up in the palace as the Pharaoh’s daughter’s son and be called Prince Moses! She even paid Moses family for nursing him as baby! And the history says the rest, he became the deliverer of Israelites after the yolk of slavery for 450 years! If God has a plan about you, He’s able to turn the tables in such a way that even the most unfavorable situations will turn to your good! 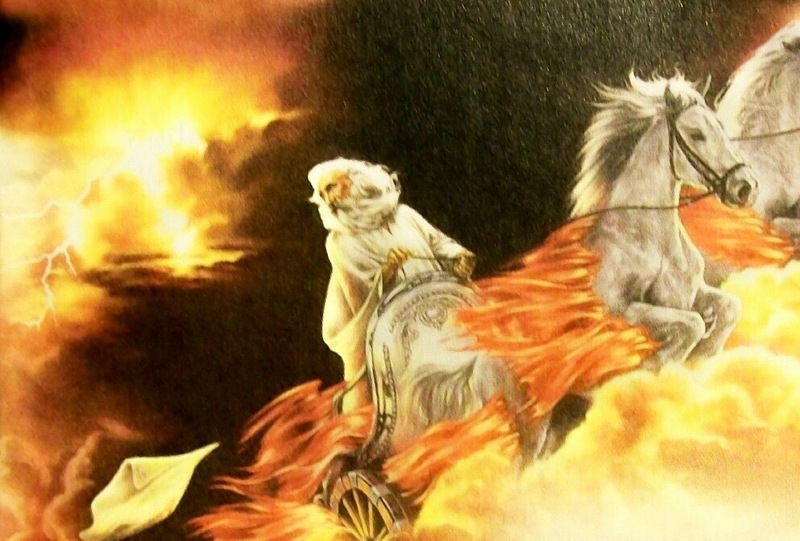 Later, during the time of King Ahab and Queen Jezebel, the people of Israel turned away from God and God sent Elijah, a prophet to reveal to the people, who the real God is. Through him, God did such amazing signs – once even bringing fire from heaven and burning a sacrifice – an object that was soaked in water! He proved before all Israelites that Jehovah was the only true God! He asked the people to catch and bring all the false prophets of Baal and Asherah, killing 850 false prophets all together that day. That moment, Elijah must have thought things were running in his favour, but the very instant the Queen heard what Elijah had done, she issued an order to kill Elijah by next day and he had to flee for his life! He got so depressed and lonely and cried out to God, but he never got any answers even after 40 days of waiting. He even wished for his death. Finally God appears before Elijah and anointed him for a new assignment to anoint three other people. When his ministry on earth was over, he was taken alive into heaven without seeing death! What I want to focus here is not just about Elijah, but the fact that God had protected another 7000 people during those difficult times! If God had done that won’t he do that again today??? Yes, He will and He is able and His hands have never grown weak. So you of little faith what are you afraid off? Countries can turn their backs to God and wherever you look in today’s society, you only see injustice and vulgarity and we think where is this world heading to and where is God and why is God keeping silent and why is God not seeing my justice! But, let me tell you, he watches over each one of us. He knows exactly what you are going through and He will act upon the injustice and problems you face in the right time and turn the tables in such a way that the hands which turned against you will be working for your good, He not only protects you, but also the others who obey him. As said above, He’s able to do miracles in the most unbelievable way and get you out of misery to glory! When your enemies try to kill you for no reason or just being jealous on you, God will turn that evil to work up for your good! I want to quote one such instance and will conclude this article. During the reign of Jahoiakim in 597 BC in Judah, Nebuchadnezzar the emperor of Babylon came and attacked the land of Israel. As the people had turned their backs against God, even after repeated warnings, God gave them over to Nebuchadnezzar. They were taken away as slaves to Babylon. Even then, God doesn’t forget His children. He made the king to select 50 of the Israeli youths to be used at the palace for his service and among them were Daniel (Belteshazzar) Hananiah (Shadrach) Mishael (Meshach) and Azariah. They were not special than the others who got selected, but when they determined to honor God even in their adversities, God honored them even in their enemy’s land! God anointed Daniel with such amazing wisdom that Nebuchadnezzar made him to be the Prime Minister of his whole empire. He served as Prime Minister during the reign of next three Kings! Daniel’s friends also held noble positions in the kingdom. Some of the Babylonians were jealous of Daniel’s growth and so they searched all ways possible to trap him but they couldn’t. So finally they made a plot asking the king to issue a rule that all people of the land must worship the king as God and that those who refuse to bow before him, be thrown into the lion’s den. Daniel, as usual, opened the windows towards Jerusalem and started praying and soon enough the enemies brought him before the king and the king had no choice but to put him in a lion’s den! But God who knew this plot had already ordered the lions, not to touch his servant Daniel and hence the lions didn’t do any harm to Daniel. He slept peacefully in the lion’s den!!! The next day the king himself came to see Daniel and was astonished to see him alive! 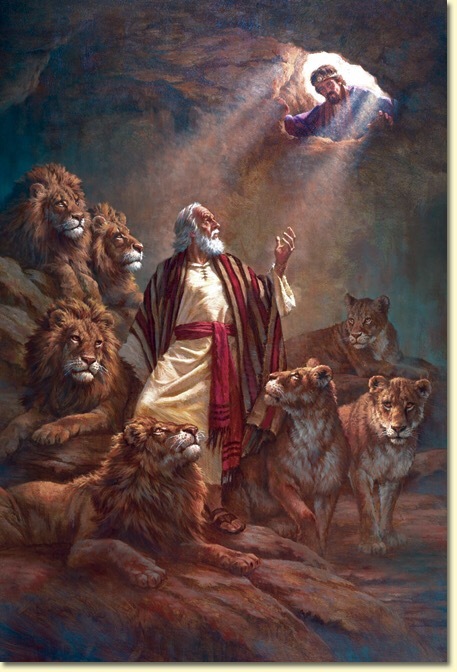 He ordered to get him out of the den and ordered those who made the plot to be thrown into the pit along with their families and even before they reached the bottom of the pit, the lions caught them and tore them apart. The King promoted Daniel to be his senior advisor! See how God turned the enemies plan for his good and protected his servant Daniel! Again in another instant, a similar situation arose. 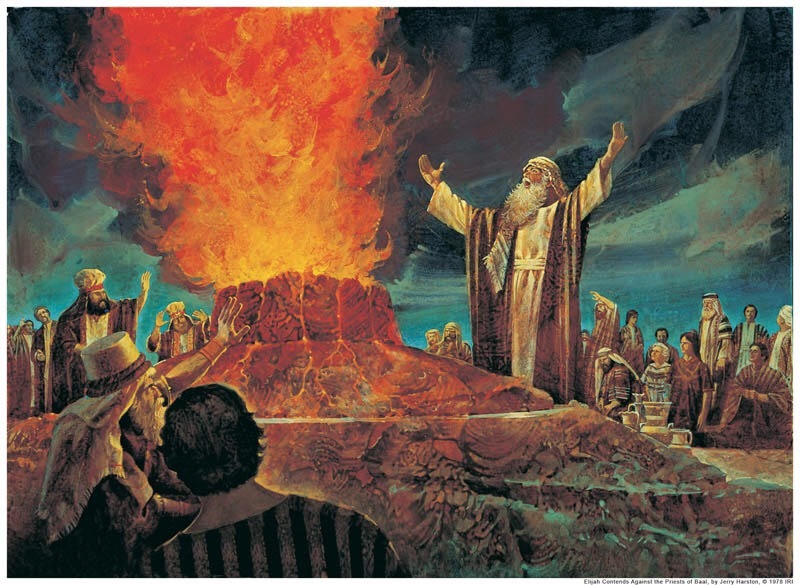 This time the king himself made a huge statue of gold and asked the people to worship that image as God and those who disobeyed were to be thrown into the furnace of fire! Daniel’s friends refused to obey the king and soon they were caught. The king got so mad that he ordered the furnace to be heated seven times more than the usual and then led Hannaniah, Mishael and Azariah into the furnace. They trusted the Lord! Those who tied them to throw them into the fire got burnt and killed by the heat, but the fire could not touch them! Their shackles melted away, but not even a single strand of their hair got burnt! 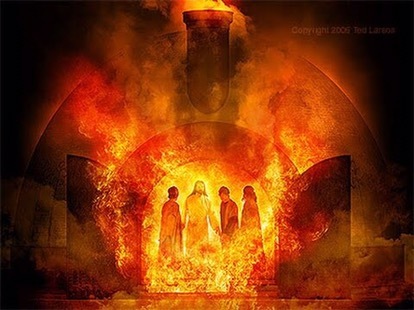 And God himself came down into the pit along with the three youngsters.The king asked his servants if they put three people in furnace and his servants said yes.So he asked about who the fourth one was and that he looked like God! The king ordered them to come out of the furnace and was astonished to see that they did not even smell of fire! He not only withdrew the law, but also promoted these four youngsters to nobles! Dear children of God, when the enemy throws trials at you, try to punish you for evil, don’t worry. You might think this is it, this is your end, but, If you are standing for God and you are a child of God, He has greater plans for your life and for your future and He will turn the tables in the most unbelievable way and will turn the evil for your good! So dear children of God, you don’t have to worry about what is happening in this world and what sort of rulers are yet to come, but believe in the God who created you, who has a plan for you, a bright future for you, who can change even the worst adversities for the best in your life. God is a sovereign God and He will take good care of his children! This was great. I thoroughly loved this and I’ve always loved the story about Joseph. 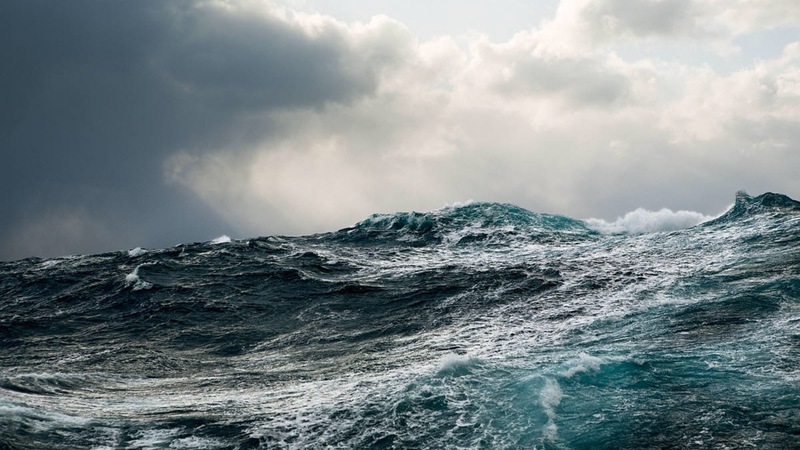 Right when we think things may be taking a wrong turn, the wrong turn actually turns on to the correct path that serves a higher purpose and our higher good. God sets up one and puts down another, elected leaders and kings could not have authority unless God gave it to them. Thank you for sharing. Peace and love to you. Very true, well said! God bless!